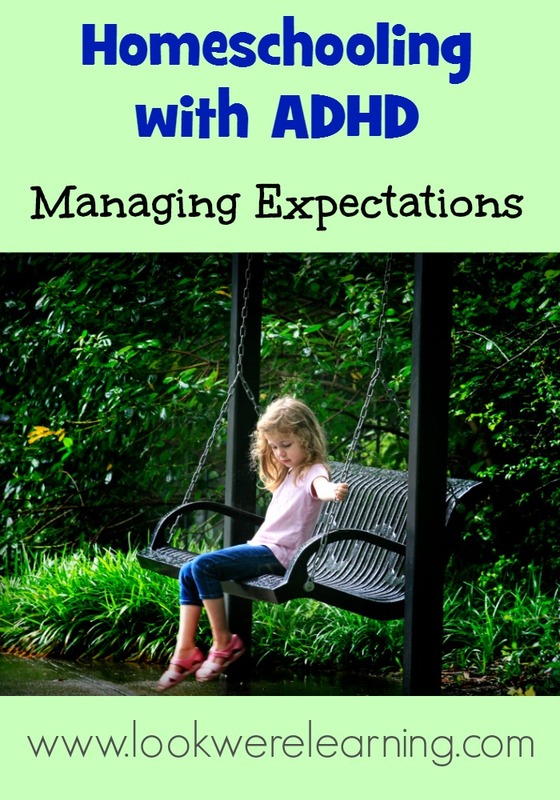 Homeschooling with ADHD: Managing Expectations - Look! We're Learning! As we mentioned last week, Tigger has been tentatively diagnosed with ADHD and we suspect that Roo may have some attention issues as well. So we’ve had to make some changes in how we approach our homeschooling journey. Interestingly, the biggest change I’ve had to make personally is in how I view a productive school day. When I first started thinking about homeschooling, I envisioned a full day of lessons, experiments, crafts, play, and music. That’s just not possible with a child who has ADHD, though. We have to take frequent breaks in every subject, so we have to limit the amount of work we do daily. On some days, we do good just to complete one or two subjects. This post contains affiliate links, which help support this site. Thank you! At first, I felt like I was failing Tigger by not covering every subject every day. I also thought that she wasn’t living up to her abilities and that I needed to require her to work harder. Over time, though, I found out that trying to insist that she live up to what I thought a “normal” child should be able to do was unfair to both of us. So we stopped trying to do all the subjects daily and just focused on two or three at most. Depending on the kids’ attention spans, we may even alternate math and language on separate days so that we only have to focus on one “sit down” subject per day. Rather than attempting to recreate public school, our goal is to create an engaging environment that will make our children excited about learning in general. We can do that without spending all day in the school room. In fact, all of us are happier when we have a more relaxed approach to learning. For the subjects that require structure, such as math, we use timed lessons. Tigger has trouble with math concepts in general, so I focus on no more than one concept per week. If it’s a core concept such as division, we might spread it out over several weeks. I’ve also been known to break up worksheets into sections, so that the work doesn’t seem too overwhelming. Have you found that you’ve had to change your expectations of an ideal homeschooling day? Have you seen any progress since making adjustments? Let us know in the comments! Each of my Kiddos require a different schooling approach. My youngest is on the Spectrum, we never know what kind of day he’s going to have. So, we have to go with the floooooow! Yes! It’s even more tricky when there are different learning styles and needs within the family. We’ll be talking about caring for the non-ADHD kids in a later post. But you’re absolutely right about going with the flow. That’s not one of my strong points…lol.